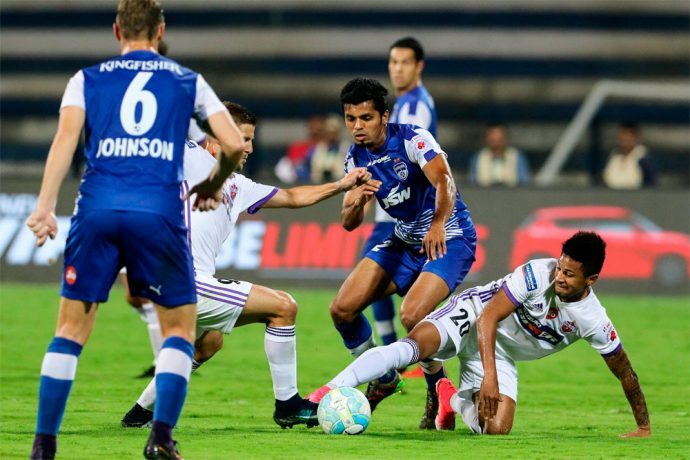 Rahul Bheke wrote the last lines in a script that saw Bengaluru FC crowned Indian Super League champions with a 1-0 win over FC Goa in the final, held at the Mumbai Football Arena, in Andheri, on Sunday. The Blues’ defenders 118th minute header from a Dimas Delgado corner sealed the title for Carles Cuadrat’s men, who secured their sixth trophies in as many seasons. In keeping with the build-up to what was touted as a battle of equals, Cuadrat and Lobera both started with a 4-2-3-1. The Bengaluru boss paired Rahul Bheke and Juanan Gonzalez in the centre of defence, while Harmanjot Khabra dropped back from the midfield to right-back and Nishu Kumar kept his position on the left in defence. Alex Barrera, playing only his third game for the club, had Dimas Delgado for company in the midfield. In attack, the trio of Miku, Udanta Singh and Sunil Chhetri had Xisco Hernandez sitting just behind them to orchestrate chances. After a cautious re-start to the game, Goa began finding their feet in attack, but kept running into Gurpreet Singh Sandhu who saw off a few half-chances without much fuss. Ahmed Jahouh had the best chance, picking up a lay-off from Jackichand Singh only to see his attempt on target with the side of his foot, fly straight at Sandhu. With a little more than twenty minutes to regulation time, Cuadrat made his first change, replacing Barrera with the more attacking Luisma Villa. Bengaluru had the chance to stick one leg in the door when Xisco picked Miku with a deft touch in the box in the 81st minute. The striker beat the last line defence and poked past an outstretched Kumar, only to see the ball come off the post. Goa then survived another Bengaluru attack in the third minute of stoppage time when Miku looked to hook the ball beyond Kumar from in the box. But Mourtada Fall was at hand to head the attempt out for a corner as referee Taqi Jahari blew his whistle to take the final into extra time. The first half of extra time looked like passing by with only Xisco’s rasping drive from 30 yards that Kumar kept out, worth talking about. But that was till Jahouh lashed out at Miku and caught the striker in his midriff on the follow through of a challenge. Already booked in the first half, the Moroccan midfielder was sent off by Jahari, reducing Goa to ten men with fifteen minutes to play for. Looking to make the most of the numerical advantage, Cuadrat made his second change, bringing on winger Boithang Haokip for Nishu Kumar while also sending on Kean Lewis in place of Udanta Singh. Bengaluru broke the deadlock just two minutes from the final whistle. Having won a corner off Gama, Dimas swung in a set piece that found Bheke unmarked in the area. In space and with time at his mercy, the defender looped a header wide and clear of Naveen in the Goa goal, as the ball shook the net off the upright to send the traveling Bengaluru supporters into delirium. Bengaluru then sent on Albert Serran in place of Xisco as Cuadrat put a lid on things to secure the Blues’ first ever Indian Super League crown.